New immigrants greeted by Immigration and Absorption Minister at Ben Gurion Airport. Many fled Ukrainian civil war. 293 immigrants from Ukraine landed Tuesday morning at Ben-Gurion Airport on three different flights organized by the Friendship Foundation headed by Rabbi Yechiel Eckstein. Immigrant Absorption Minister Sofa Landver received the immigrants at the airport, along with dozens of volunteers who preceded the immigrants with singing and dancing. For the first time, in order to ease and reduce the bureaucratic procedures of registering immigrants and issuing their identity cards in Israel, a number of representatives of the Interior Ministry were flown to Ukraine at the beginning of the week. The procedure saved the Olim from a significant part of the bureaucratic process that most immigrants have to undergo after their arrival in Israel and enabled them to focus on many other important efforts, such as registering for schools, finding employment, and more. Before the immigrants arrived in Israel, they participated in a preparatory seminar for life in Israel and a unique employment fair designed to provide employment solutions for immigrants before their arrival in Israel. After the arrival of the immigrants, the Friendship Foundation provides each Oleh with additional economic assistance in addition to the grant granted through the Absorption Basket, and closely monitors the Olim for six months, in order to ensure that they are properly integrated into Israeli society. The President of the International Fellowship of Christians and Jews, Rabbi Yechiel Eckstein, congratulated the Olim: "The summer months are an exciting period of peak immigration to Israel, and I am proud of our ability to improve the absorption system of the Friendship Foundation through partners such as the Ministry of the Interior, the Ministry of Immigrant Absorption and the local authorities. I am grateful to all our partners for the effort and wish the immigrants easy absorption and a pleasant and safe summer." In a ceremony held in honor of the immigrants at the airport, in the presence of Immigration and Absorption Minister Sofa Landver, the minister said to the excited immigrants: "Welcome to the State of Israel. Every plane landing event with new immigrants at Ben Gurion Airport is a day of joy for me and for our country. 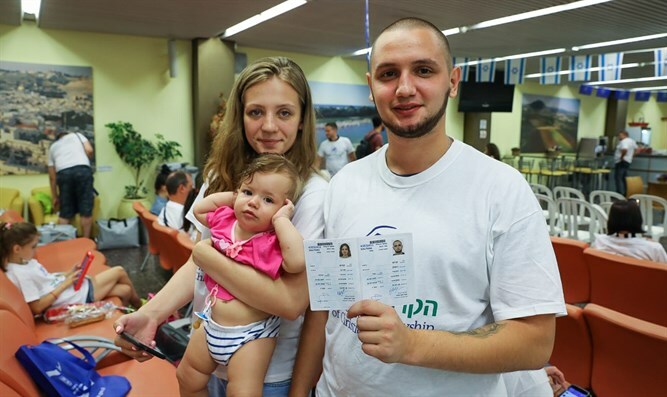 The Ministry of Immigration and Absorption, together with its partners, continues to encourage aliyah and to bring immigrants from the Former Soviet Union, and you, new citizens, are helping to develop all aspects of life in this country that today has become your home and contribute to Israeli society in all its aspects." Later, Minister Landver promised that the Absorption Ministry would accompany the immigrants in their new life and would assist in the process of integrating them as citizens of the State of Israel. "We, the Ministry of Immigration and Absorption, are now your address." The immigrants are expected to be absorbed in 33 cities across the State of Israel, with the absorption peak being the city of Haifa, to which 38 immigrants will arrive. Next in descending order will be the cities of Nahariya (28), Upper Nazareth (23) and Rishon Lezion (22). A total of 74 children under the age of 18 are expected to arrive, of whom 47 are under the age of 10. The youngest immigrant arriving in Israel this morning is 7 months old and the oldest immigrant is 80 years old. The huge flight from the Ukraine brings Olim from various cities, some of them from the war zones which suffered from the difficulties of the civil war; The vast majority of the immigrants testified that the economic distress and the high cost of living were a significant reason for the decision that led them to immigrate to Israel. Konstantin K., 33, is an attorney by profession and immigrated to Israel with his wife and son from the city of Donetsk, which has seen severe fighting in recent years: "To this day, chaos reigns in our area of ​​residence. We are forced to leave behind our house, which we were unable to sell. Life is no longer safe in the area from which we arrive. In addition, I am an attorney, a profession that has no purpose in a region that is in combat, and the rest of the Ukrainian population is unable to finance my services now, leaving me without a livelihood at all." Alexander K. (65) immigrated to Israel with his wife from the city of Odessa. He said: "Our immigration is due to several reasons. Firstly, the authorities in the country are becoming more and more fanatic. They are giving instructions about the language they want us to talk in and the contents they want us to consume. Education is no longer an important principle, but the most important and significant reason for us is our clear desire to live in the Land of Israel and to join our family living in Israel."